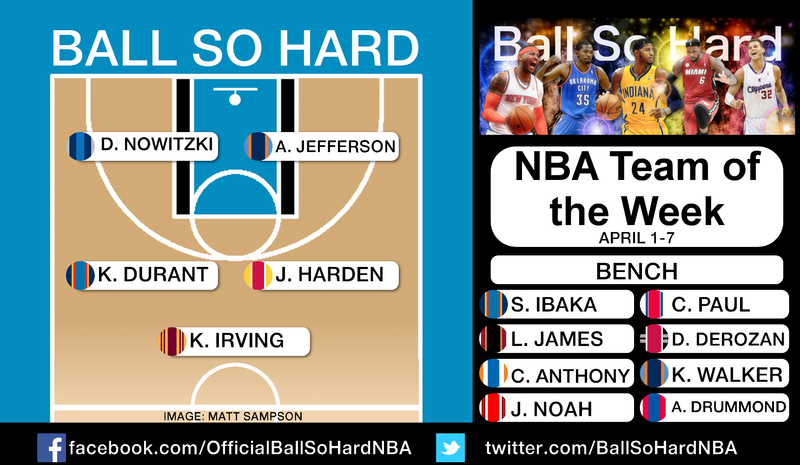 Each week Ball So Hard, in association with Fiasco Sports, will be bringing you a comprehensive wrap of the past week’s best performers from the NBA. Did your favourite player have a dominant week? Did he make the cut for the Team of the Week? Check out our selections below and let us know your thoughts in the comment section. Note: The Team of the Week has a strict positional structure – two guards, two forwards and a centre in the starting five, plus a three-guard, three-forward and two-centre bench. Selections are strictly position dependant. Players must also play a minimum of three games over the seven days. Another excellent week from Oklahoma City Thunder forward Kevin Durant saw him extend his streak of games with at least 25 points to 41, moving him past Michael Jordan and into third all-time for such a stretch. In a three-game week for the Thunder, Durant led his team to a 2-1 record, averaging 29.0 points (second in the league over the week), 7.7 rebounds and 6.0 assists per game, while shooting 46.6% from the floor, 41.2% from deep and 96.3% from the line. Durant’s former teammate, and current Houston Rocket, James Harden topped the league in scoring for the week, averaging 30.3 points per game over three games. Without Dwight Howard in the line-up, Houston struggled to a 1-2 record, but Harden battled valiantly, adding 5.3 rebounds, 6.0 assists and 2.0 steals per game to his high-scoring week. After missing two weeks with a bicep injury, Cleveland Cavaliers point guard Kyrie Irving returned to the floor, averaging 24.7 points, 6.7 rebounds and 3.3 assists over three games while hitting 53.7% from the field. Although he was eased back into action, he capped off the week with a 44-point, 8-assist and 7-rebound performance against the Bobcats. A star performer for that Bobcats team, and making his second-consecutive appearance in the starting line-up of the Team of the Week, is big man Al Jefferson. Big Al carried the Cats to a 4-0 record over the week, notching a double-double in each game – including two games with at least 24 points and 15 rebounds. Overall he finished the week with averages of 24.3 points, 13.0 rebounds (fourth in the league) and 1.3 blocks per night as Charlotte clinched their second playoff berth in franchise history. Rounding out the starting five is Dallas Mavericks superstar Dirk Nowitzki. The big German scored at least 26 points in each of his three games and fell only one rebound short in his final game of reaching a double-double in ever game. His 28.7 points per game was third best in the league, while his 10.3 rebounds a night was also top-15, and he shot a ridiculous 64.2% from the field and 64.7% from downtown over the week. He also kept the Mavs in the mix for a playoff berth, going 2-1 for the week. Point guard Chris Paul kept the Clippers offence churning as they motored towards the postseason (going 2-1 for the week), dishing out 9.0 assists per game – third best in the league. The heady floor general also put up 19.7 points per game and was red hot from the charity stripe, nailing 93.3% of his attempts during the week. Toronto Raptors high-flyer DeMar DeRozan didn’t let a five-game schedule effect his production, scoring 23.2 points per game (11th in the league), grabbing 3.2 rebounds, dishing 5.2 assists and swiping 1.2 pockets per game as he pushed the Raps to a 4-1 record. Despite several poor shooting performances (31.8% from the floor and 20.0 from deep – including a 0-10 performance against Washington), Kemba Walker (15.5 points, 8.0 assists, 4.8 rebounds and 1.3 steals per game) played a key role in Charlotte sweeping their four-game week. He notched two double-doubles, one triple-double and hit the 20-point mark twice over the week. LeBron James did his best to try and push his Miami squad into sole possession of the one seed in the East as the Heat went 2-1 for the week. The reigning MVP producing 27.7 points (fourth in the league), 6.3 assist, and 7.0 rebounds (first amongst forwards) per game. He was also an efficient scorer, making 53.6% of his field goal attempts. Thunder forward Serge Ibaka provided help all over the floor, averaging 18.3 points (at 56.1% from the floor and 50.0% from beyond the arc), 9.0 rebounds and a league-leading 4.3 blocks per game over his team’s three-game schedule. The Knicks momentarily pushed their way back into the playoffs thanks to a 3-1 week led by Carmelo Anthony. Melo worked tirelessly for a resurgent New York side, providing his team with 21.5 points, 8.8 rebounds, 3.5 assist and 2.3 steals per game. Chicago Bulls pivot Joakim Noah continued to thrive despite the loss of Derrick Rose and Luol Deng and solidify his credentials as a sure-fire All-NBA selection. Noah led the Bulls to a 5-0 record for the week, collecting a double-double in each game – four point-rebound combinations and one point-assist effort. He finished the week averaging 14.8 points, 10.6 rebounds, 6.2 assists and 1.4 steals and with his team tied for the third-best record in the Eastern Conference. Meanwhile, Andre Drummond put in a dominant showing on the boards for Detroit over a four-game week. The sophomore centre was unstoppable on the glass, grabbing a league-leading 17.0 boards per night to go with 16.3 points at 67.4% shooting. Drummond grabbed at least 14 misses in each of his four games – a stretch that saw the Pistons go 2-2 – and capped off his week with a 19-point and 20-rebound double-double against Boston. Check out our Team of the Week archives here.